Answering the musical question, ‘you say you want a revolution?’, Grant Peeples returns with new music to back the same agenda of righting the wrongs by writing a song. Settling Scores, Vol. 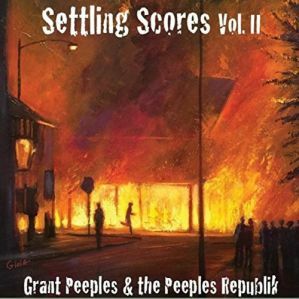 II, the recent release from Grant Peeples and the Peeples Republik finds Grant once again standing in Ruby’s backyard with the Bob Dylan tune “Brownsville Girl”. Grant Peeples and the Peeples Repulik re-work the tale as Grant re-reads Bob’s letter and turns the page with a personal history. 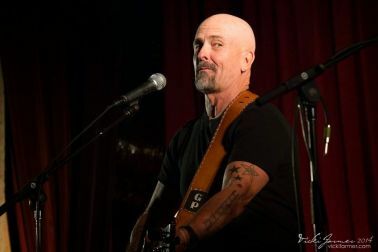 Grant Peeples pays homage not only to Bob and Sam Shepard, Bob’s co-author on the tune, …he traces the stories heritage back through Lou Reed and Woody Guthrie. “The New Brownsville Girl” relates its own tale, a story it has carried ‘for over thirty years’, blending the words of others with a parallel story line scattered into the Texas wind. Finding more letters lying around the studio, Grant Peeples and the Peeples Repulik read an open letter with “Dear Judas” as the band pick up their instruments to take down a snaking line of “Pitchforks and Torches” as they take a swing at the reptiles holding them aloft. Grant Peeples takes a seat as he watches three young women prepare for an event with “The Black Dress” as The Peeples Republik pluck out a beat to pace themselves for “It Could Be a Long Night” while Settling Scores, Vol. II producer Gurf Morlix pops out a commercial for ‘high fructose” to set the mood for “More for Us, Less for Them” as it points fingers and names names. Borrowing a tune from Steve Earle, Grant Peeples and the Peeples Republik back Grant and Jaimee Harris as the pair recall the good times, forgetting the bad and wondering if they ever said “Goodbye”.